NEW TILE ROOF 2019!! EXTERIOR NEWLY PAINTED! NEW A/C system! This spacious pool home offers wood laminate flooring throughout and access to spacious, covered lanai, pool and yard from all living areas. A screened, covered patio welcomes you to the entry of this well-maintained 2 Bedroom, 2 Bath home with Family Room off of Kitchen. Sliding Doors in Family Room and LR/DR access outdoor dining and entertaining areas and pool. Kitchen offers granite counters, wood cabinetry and breakfast bar that open to Family Room. 1-Car Garage. Beautifully landscaped property is fenced. Great Lantana neighborhood East of Federal with no HOA. Seller wants offers! Pls see floor plan in documents section. Please see Supplemental Remarks for neighborhood info.NEW ROOF 2019!! New Exterior Paint! New A/C system! And its Location is simply The Best! This is a quiet coastal neighborhood that is less than 1 mile to the ocean beach, dining, shopping and public boat ramp as well as a 'for-residents-only' Intracoastal access for kayaks, paddle boarding, and small vessels. 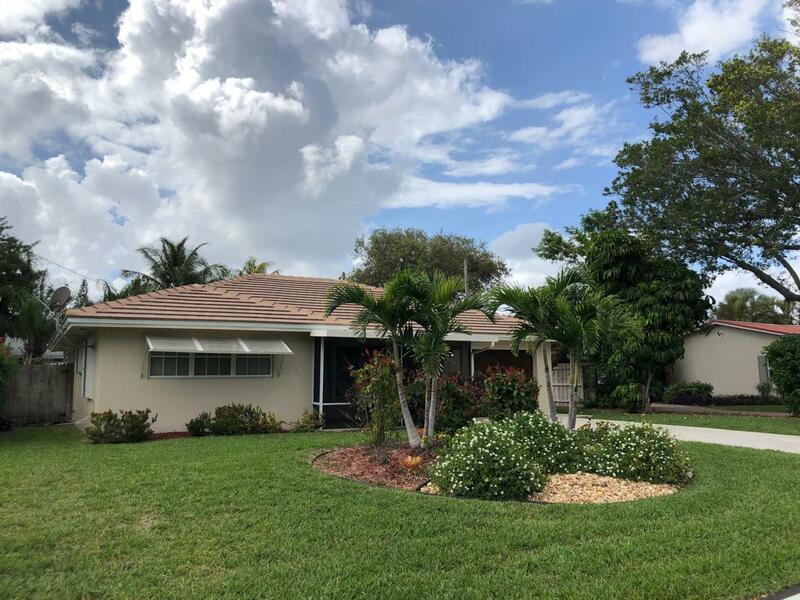 This home is move-in ready, beautifully landscaped with sprinkler system, a fenced yard and pool and there's even room to park a boat or RV next to the garage. Screened enclosed porch entry leads to large, living and dining areas. The interior doesn't disappoint with a great layout, newer kitchen, laminate flooring and sliding doors from the living areas to the covered patio and pool area. Properties rarely come on the market in this neighborhood, so make an appointment to see!